Wahooo! And not a moment too soon, either. We have new seasonal wall quote designs. 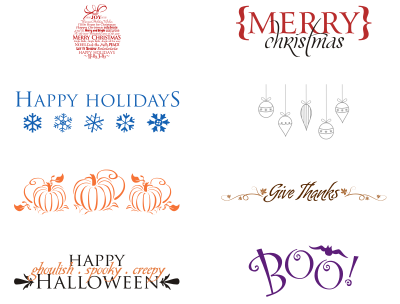 Many of the previous ones are still there (and in more size options), but there's plenty of new Christmas wall quotes and Hanukkah wall quotes and Fall wall quotes and Hallowe'en wall quotes. Whew! They're spooky and whimsical and elegant and fancy and oh so much fun. See? Visit our site to find more fabulous seasonal wall quotes and enjoy!